Are you looking at how to get more out of your social intranet? How do you encourage contributions to your online community? 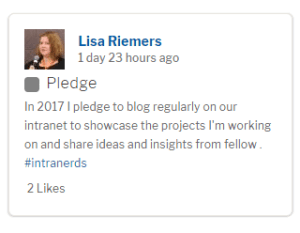 One way we’re doing this here at Invotra is by using our new Message Wall feature to submit our own pledges to improve the way we communicate. This is one of the many features we have as part of Invotra’s social intranet product that was born out of a request from one of our customers and is fast-becoming one of *our* favourites! It’s not just for New Year’s resolutions – do you run an employee of the year programme? Would you like to publicly thank a colleague that’s gone the extra mile? Whether it’s congratulating someone for winning an award (our Andrew is currently at the top after scooping Apprentice of the Year at the SME Surrey Business Awards) or flagging those who may be part of an internal security initiative the dashboards have already proved to be a valuable way of driving adoption of the intranet in our office. It’s easy to set up and use (we’ve found our list of categories has already evolved since we implemented it a few weeks ago) and using our dashboard you can see at a glance who are the most active members of your community. Having a leaderboard has proved to be a great way to encourage our competitive team to actively interact with the site. That, coupled with strong leadership buy-in from our CEO (check out who’s currently top of our leaderboard for usage stats below) has made it a firm favourite amongst the team here and is becoming a valuable way to recognise our successes, share expertise and encourage colleagues to contribute to our internal social network. 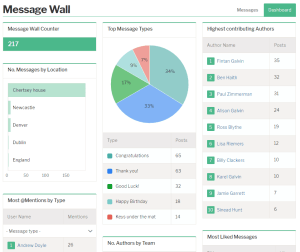 The Message Wall feature is part of Invotra Social – if you’re interested in finding out more, get in touch with our team!